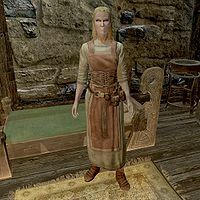 Hillevi Cruel-Sea is a Nord farmer who sells food from her stall in Windhelm's marketplace. If you ask her whether she grows her own crops, she mentions that she also grows herbs, reminding her that she has some Nightshade she wants delivered to Wuunferth the Unliving. She lives in the House of Clan Cruel-Sea with her husband, Torsten, and their son, Grimvar. She wakes up every day at 7am and eats breakfast, then heads down to the market and opens her stall for customers. She spends twelve hours there until she returns home for a four-hour dinner before bedtime. She wears attire fit for a merchant with clothes and boots. She carries her house key and an assortment of upper-class items and gold. When she's at work, she will try and sell her wares the best way she can, shouting: "Fresh fruit and vegetables for sale! ", "Fruits and vegetables, all ripe and ready for your table! 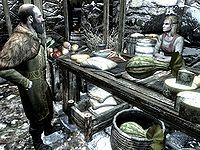 ", and "Take home Windhelm's finest and freshest produce today!" If you talk to her outside the market, she will say: "Good day to you." and follow it up with: "If you're not doing something you enjoy, then you're wasting your life." If you ask her if it is tough to get anything to grow in Skyrim, she will explain: "There's an old saying that only a Nord can work the soil in Skyrim. I don't think anyone else would have the patience for it. It takes half a day just to dig a planting row in the cold, stony earth here. But what else can we do, eat rocks and ice?" If you ask her if she grows her own crops, she will reveal where her wealth comes from and ask for a favor: "Everything you see is grown at my family's own Hollyfrost Farm. Fresh and filling. I also do a little herb growing. The court wizard, Wuunferth, pays us to plant a little Nightshade. Who knows what he uses it for? Hey, could you deliver this bottle of Nightshade Extract to Wuunferth?" Nilsine: "Is that new batch of tomatoes ready for sale yet, Hillevi?" Hillevi: "You know, I'm not sure. My husband's been tending to the vines, so I'll have to ask him." Nilsine: "Just promise me when you get some more in, I'll have the first crack at them." Hillevi: "What is it Ulfric's always saying... "On my honor as a Nord, I swear it."" (Laughter). Torbjorn: "I wanted to thank you again for the mince pie you sent over. It was delicious." Hillevi: "It was my pleasure, Torbjorn. I enjoy cooking, and after what you and Tova have been through, it was the least I could do." Torbjorn: "My little Friga loved to cook, but she was terrible at it. Then one day, out of nowhere, she made the most amazing leek soup. She watched while we ate it, and when she saw how much we loved it, she was... so proud..."
Hillevi: "I... I'm so sorry, Torbjorn. You must be suffering terribly. I wish there was some way I could help." Torbjorn: "You've done more than enough already. You've been a good friend in a time of need, and we won't forget that. I'm sorry I lost myself for a moment there. I just need some time to get over the loss." Hillevi: "Well enough, I suppose. Nilsine bought up most of the tomatoes, and was asking if we could get more." Torsten: "We've got another dozen ripening on the vine. They should be ready in a few days." Hillevi: "I'll be sure to tell her." Delivery: Deliver a bottle of Nightshade Extract to Wuunferth the Unliving. Tulvur: "And what about the dogs? How are those precious little angels?" Hillevi: "Healthy and strong. Ysgramor's coat's gotten so thick, he looks fat!" Tulvur: "Oh, that's just adorable." Hillevi: "How have things been with you?" Tulvur: "I got another harangue from Torsten yesterday." Hillevi: "Don't worry about him. I know you work hard, and I'm the one who gets you your money." Tulvur: "Thank you, miss, I appreciate that." This page was last modified on 21 February 2019, at 01:41.